A Democratic memo written under the direction of ranking member of the House Intelligence Committee Adam Schiff. Their intel memo confirms the FBI used Clinton research to spy on Carter Page. The House Intelligence Committee on Saturday released the long-awaited Democratic response to allegations the FBI abused its surveillance powers during the 2016 election. Committee Chairman Devin Nunes owes ranking Democrat Adam Schiff a thank you for assisting his case. The 10-page Democratic memo begins by declaring that “The FBI and DOJ officials did not ‘abuse’ the Foreign Intelligence Surveillance Act (FISA) process, omit material information, or subvert this vital tool to spy on the Trump campaign.” Yet the facts it lays out show the opposite. In particular the memo confirms that the FBI used an opposition-research document paid for by the Hillary Clinton campaign and Democratic National Committee as part of its application to surveil Carter Page, who was associated with the Donald Trump campaign. Democrats dispute the degree to which the FBI relied on the dossier created by opposition-researcher Christopher Steele in applying for its FISA court order, but that’s beside the point. If the FBI had as much “compelling evidence” and “probable cause” as the memo asserts, it would not have needed to cite the Steele document. And the Democrats do not dispute that the Steele dossier was the FBI’s only source in its initial FISA application for its allegation that Mr. Page met with suspect Russians in Moscow in July 2016. Democrats say the FBI told the FISA court that a “law firm” [Clinton/DNC firm Perkins Coie] hired “an identified U.S. person” [oppo-research firm Fusion GPS co-founder Glenn Simpson ] to “conduct research regarding Candidate #1s ties to Russia.” The “identified U.S. person” then hired “Source #1” [Mr. Steele] to do the research. The Democratic memo claims the FBI acted “appropriately” in not “revealing” the name of an “entity” in a FISA application, but this is laughable. 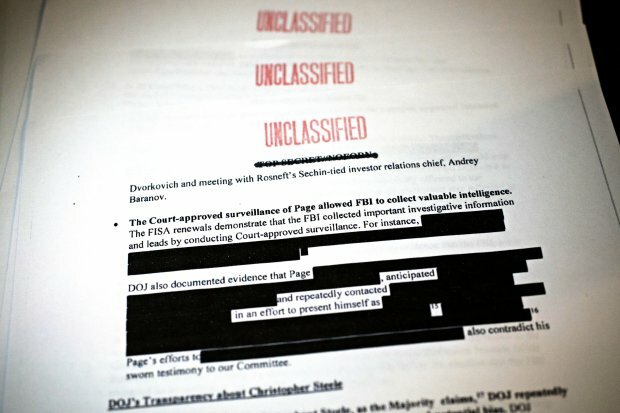 The FBI sometimes masks identities to preserve sources and methods, but the Steele dossier was a pastiche of gossip and rumor based on Mr. Steele’s contacts. Disclosing his partisan funders would have betrayed no important intelligence sources but would have given the court reason to ask the FBI for more credible information before granting an eavesdrop order. Messrs. Steele and Simpson briefed their media friends in September and October about their dossier, despite FBI prohibitions. The FBI nonetheless falsely told the court that Mr. Steele wasn’t the source of a Yahoo News article that it used as additional evidence in its application. While the Democratic memo repeatedly refers to Mr. Steele’s reporting as “reliable” and “credible,” it confirms that the FBI fired Mr. Steele after it found he hadn’t told the truth about his media spinning. The only definitive evidence of political “collusion” so far is that the Clinton campaign paid Mr. Steele to troll his Russian sources for dirt on Donald Trump. The FBI then used this dirt as a reason to spy on Mr. Page and anyone he was communicating with. Imagine how the press would be playing this story if the roles were reversed?